Binder The bonding agent used as an additive to mold or core sand to impart strength or plasticity in a “green” or dry state. Burn-on sand Sand adhering to the surface of the aluminum casting that is extremely difficult to remove. Cupola A cylindrical, straight shaft furnace (usually lined with refractories) for melting metal in direct contact with coke by forcing air under pressure through openings near its base (Fig. 1). Art courtesy of Chicago Fire Brick Co. Fig. 1. This diagram of a cupola illustrates the furnace’s cylindrical shaft lined with refractory and the alternating layers of coke and metal scrap. The molten metal flows out of a spout at the bottom of the cupola. 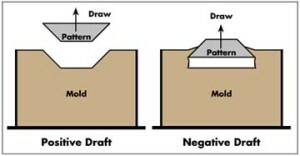 Draft Taper on the vertical sides of a pattern or corebox that permits the core or sand mold to be removed without distorting or tearing of the sand (Fig. 2). Fig. 2. Shown (from l) is proper, positive draft and incorrect, negative draft. Draft refers to the taper of the pattern, which allows it to be extended from a compacted sand mold. Feeder Sometimes referred to as a “riser,” it is part of the gating system that forms the reservoir of molten metal necessary to compensate for losses due to shrinkage as the metal solidifies. Gate (ingate) The portion of the runner where the molten metal enters the mold cavity (Fig. 3). Fig. 3. 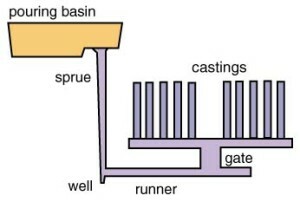 The gating system, which brings the molten metal to the mold cavity, is illustrated in its simplest form. The design of this system is critical in the introduction of clean metal to the casting mold cavity. Pattern The wood, metal, foam or plastic shape used to form the cavity in the sand. A pattern may consist of one or many impressions and would normally be mounted on a board or plate complete with a runner system (Fig. 4). Fig. 4. 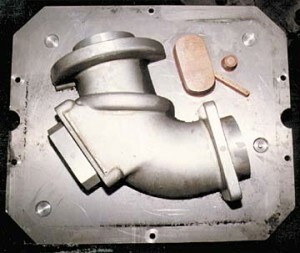 Matchplate patterns feature impressions on both the cope (top) and drag (bottom) sides, and typically are used to produce molds for small parts, such as this elbow casting. Patternmaker’s shrinkage The shrinkage allowance made on all patterns to compensate for the change in dimensions as the solidified casting cools in the mold from freezing temperature of the metal to room temperature. The pattern is made larger by the amount of shrinkage characteristic of the particular metal in the casting and the amount of resulting contraction to be encountered. Pilot or sample casting A Metal casting made from a pattern produced in a production die to check the accuracy of dimensions and quality of castings that will be made. Vent An opening or passage in a mold or core to facilitate escape of gases when the Die Casting mold is poured.